I LOVED this Willy Wonka End of the Year Party! It was SO much fun! The teacher read the book Charlie and the Chocolate Factory by Roald Dahl to the class in the month leading up to the party. Plus, they watched the original movie in the morning before the party, so the kids knew all about it and were so excited about each station! Here is what we did! I made a banner that said "Factory" with my Silhouette and hung it between the classroom doors. The font I used is called "WillyWonka". Then, we hung purple streamers from the doorway to make it feel like the kids were entering the chocolate factory when they went in the classroom! I also made "candy" from colored plastic plates wrapped in cellophane. So cute! We had 10 stations to do! Instead of doing all 10 at once, we decided to set up 5 stations at a time so that there would be 4-5 kids at each station. So, we set up and did the first 5 stations and then set up again to do the second 5 stations. To divide the kids into groups, I made golden tickets! Each golden ticket was coded with an "A", "B", "C", "D", or "E". I randomly handed out the tickets and then the 5 kids holding a ticket with an "A" on it were in one group and so on... This was a fair way to divide into groups and helped break up some of the kids that can be a handful when they are all together, especially at a party! Plus the kids loved having a Golden Ticket to keep! You can download the Golden Tickets HERE. To make changes to the time and date paragraph, you can add a text box over mine and insert your own text. I used "HelloBigSky" font in size 10 for this paragraph. I added the letters for the groups and printed the tickets on gold vellum. Violet's Bubble Blow: Chew a piece of gum. Can you blow a bubble? Who can blow the biggest bubble? Who can make the loudest pop? The Chocolate Room: Put Hershey's syrup on a plastic plate that has been taped to the table. See who can lick the chocolate river off the plate first without using their hands. 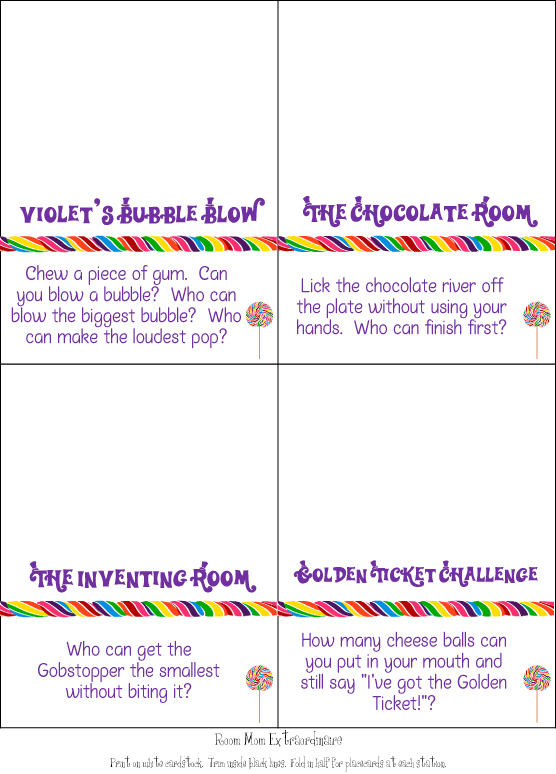 The Inventing Room: Who can get their Gobstopper the smallest without biting it? Golden Ticket Challenge: How many cheese balls can you put in your mouth and still say "I've got the Golden Ticket!"? Charlie's Fizzy Lifting Drink: Give each child a gulp of Coca-Cola. Can you burp? Who can burp the loudest? Who can burp the longest? Veruca's Egg Find: Fill a large bucket with plastic Easter eggs. Inside one egg place a piece of paper that says "Good Egg". Who can find the egg with the paper inside? 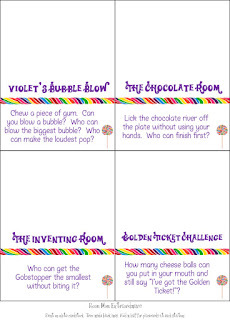 Oompa Loompa Waddle: Waddle with a purple balloon between your legs to the finish line. 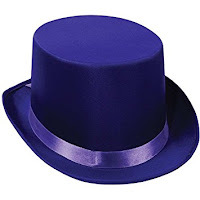 Then pop "Violet" without using your hands. Favors are completely unnecessary at an end of the year party but I just couldn't resist! This counted as our end of the year classmate gift and included, of course, a bunch of Willy Wonka candy! I put Gobstoppers, Fun Dip, Pixie Sticks, Laffy Taffy, purple sucker, Bottle Caps, SweeTarts, and Nerds in a purple bag and sealed them with gold washi tape. I attached a tag that said "Hope your summer is SWEET!" You can download the tags HERE.